Hardcopies represent one of the premiere collecting areas within the pre-production niche. Each piece is hand cast using a silicone mold taken off the original sculpting. Hardcopies exist in two forms: painted and unpainted. Complete painted hardcopies, although typically more desirable, dwarf complete unpainted hardcopies in terms of existing volume in collections, mainly due to isolated batches of painted hardcopies surfacing on the market in recent years. Unpainted hardcopy parts, like this Bib Fortuna head, allow collectors to obtain an example of the hardcopy stage at a more affordable level. Additionally, hardcopy parts allow a collector to have multiple characters in a collection, something not always feasible where complete hardcopies are concerned. Unpainted torsos and heads tend to fetch a higher price than limbs, since they represent the two most recognizable portions of any action figure. 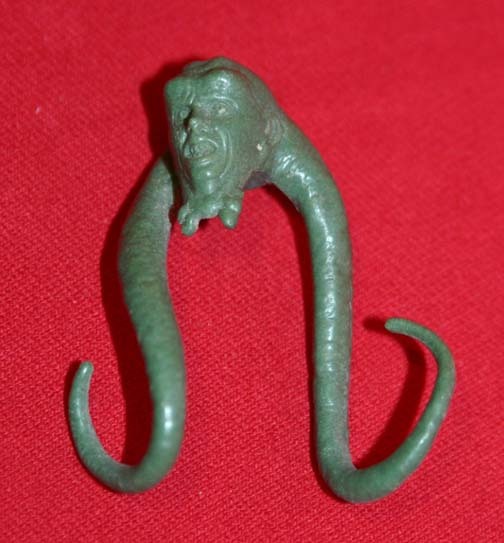 Dynacast, a green colored resin, shows up on later Empire Strikes Back hardcopies and was the most frequently used material for Return of the Jedi hardcopies like Bib Fortuna. Bib Fortuna represents a superb character in terms of owning an unpainted hardcopy head. Although a limited screen time character, Bib exhibits long tentacles which enhance the size and provide added detail. A complete Bib Fortuna painted hardcopy may be viewed here.